Blog | Three Moons Medicine | Get Un-Stuck. Engage your true life. What does the word “failure” mean to you? Sometimes it’s associated with something that didn’t turn out the way it was hoped, or exactly what was anticipated. Experiences seem to always have been exactly what we needed, when we look back with an open mind. Or, we might look at what happened and surmise we don’t deserve the result we wanted, or that yet again – we’re proved to be unworthy. I feel that way when I work on my own business after my paid day-job. I have to own the results, because it’s me. I make the mistakes and I have to make the effort to see what I missed, or what the lesson was. Sure, I could just say ‘forget about it’ and resign myself to Netflix each night, but that doesn’t move me toward my soul’s purpose. I own that. Sometimes we remember that wisdom saying about success – “if at first you don’t succeed, try again.” And it’s true! But there’s a measure of wisdom that isn’t spoken there – you can’t do the same thing over and over and expect a different result. We must look at what part of our effort didn’t work, reframe the process, and try again. Eventually, we’ll get it right. There are people who seem to go from one success to another in their lives. And these people seem to be aware of and in the flow with – their own capabilities. I’m not sure, but maybe we don’t actually believe that what is available to them might also be available to us. Maybe we don’t realize our own successes along the way. In planning to move forward, it helps to have a plan. Even if it’s as simple as completing the steps toward the greater achievement, it gives us something to focus on, and something to let us know that we did, indeed, achieve a success along the path. Right now, I’m consolidating my business ideas under one umbrella. Slimming down my offerings and concentrating on what it is I do the very best: facilitating people to realize their best lives. Does that mean that the massage, reflexology, and energy healing I do in my own clinic are a mistake? No! It means that I succeeded in identifying some things that distract me from my central skill set of facilitating healing. I set a simple and correct standard and goal for what I can do right now, while I still have a full time day job. The lesson: When we set goals that are too high or are too this moment, standards we can’t achieve at time, then we will always fail. And, by fail, I mean learn the lesson that we didn’t see at first. All of us learned life skills as we grew up. Walking, talking, dressing, crossing the street safely. Without the encouragement of parents and others, we wouldn’t have been proud and happy and willing to go to the next developmental stage or life lesson. We were eager to learn and get approval. Now that we are grown, the location of our control and praise has changed from outside our control, to an internal one. Our self talk. Do you encourage yourself and get that warm fuzzy that urges you to keep doing better and better? Or do we bash ourselves and die a little with a deflating idea and an increasing sense of resignation? It’s a choice. No matter what anyone else says, we’re grown and it’s our choice now. It’s also well to know about that old “imposter syndrome,” the thinking trick that convinces us that each little failure is proof that we don’t know what we’re doing. That we’re unworthy and nobody is going to buy our product, believe we can help, and it even tells us that we’re going to look like a fool and be “found out” to be a fake. Sound familiar? We don’t have to be afraid to try new things, or change up what we are doing so that we can have our dream – a business, a home, retirement – because working toward a goal and a dream is worth it. It’s worth the mistakes. It’s worth the lessons learned. And, it’s worth defeating that negative thought monster called “imposter syndrome. We can begin a pattern of success now, so that our subconscious minds can put together the pieces of learning into a coherent picture that lets us work more efficiently and also attracts what we need with the help of the Law of Attraction. Planting the seeds of success for the future begins now with willingness to change our belief patterns. Here are some new belief statements that you can try. If they don’t work for you, change them up and make them your own. ~ The Universe supports me with ideas that form my success. ~ All my efforts are leading me toward success. ~ There is an abundance of everything for everyone, that includes me! ~ There are customers who desire my services. ~ My awareness of success draws customers to me. ~ My life is abundant, I have all the tools I need when I need them. ~ My dreams and blessings grow with my belief. ~ I have opportunity at every moment. ~ My efforts bring me a constantly increasing income. 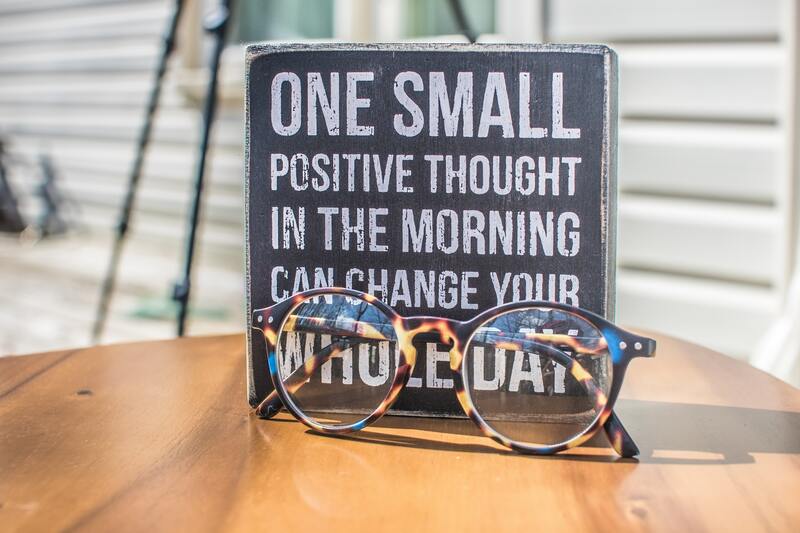 Choose one of the positivity statements above, and write it on a 3X5 card, put it on your phone with a reminder, but have it with you. Repeat it for several days – several times a day. Bring the wisdom into your consciousness, feel the words and see the words happening. As these ideas are becoming part of your consciousness and your ability to spot synchronicities (opportunities) will increase. You don’t even need to worry about the “how” to put plans into actions when ideas come to you. Your innate intelligence and connection with the Universe can guide you. Remember, despite what you think or feel right now about “imposter syndrome,” worthiness or deservingness, you’re stirring the ethers and creating change. Change in your thoughts creates change in your life. Add other affirmations as you go along. Affirmative statements are the beginning of changing your thoughts. © This post is associated with She, Ignited™ a new Masterclass under construction. © Lizzie B ennett is an Advanced Holistic Nurse, (RN), Whole Health thought leader, and Ordained Minister of some years. She is a Nurse Health Coach facilitator, and owns Three Moons Medicine™ as her private counselling and coaching practice, a blog, educational forum, Facebook page, and outreach to support others on their journey. The secret to healing at every level? 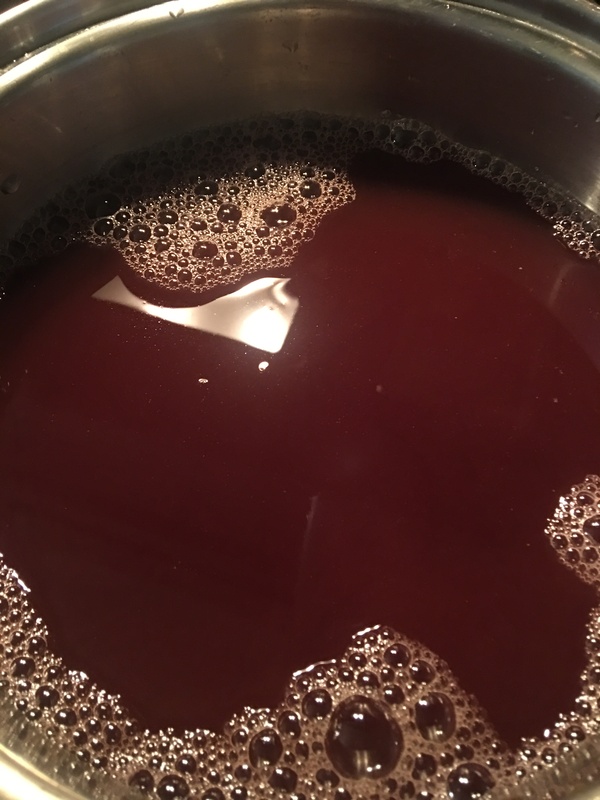 For many years, since the early 1990s, I made a simple decoction every year for coughs and colds. In the last two years, I neglected this for life reasons. However, this year, I caught a bit of a cough on March 2d 2018 that landed me on my back for 9 days, and never really went away, then came back around April 28th with a vengeance. And, it’s still here, 9 weeks. My physicians could only offer a symptomatic relief to include an albuterol inhaler. And since there are people massively abusing drugs, not even a simple codeine cough can be had these days. 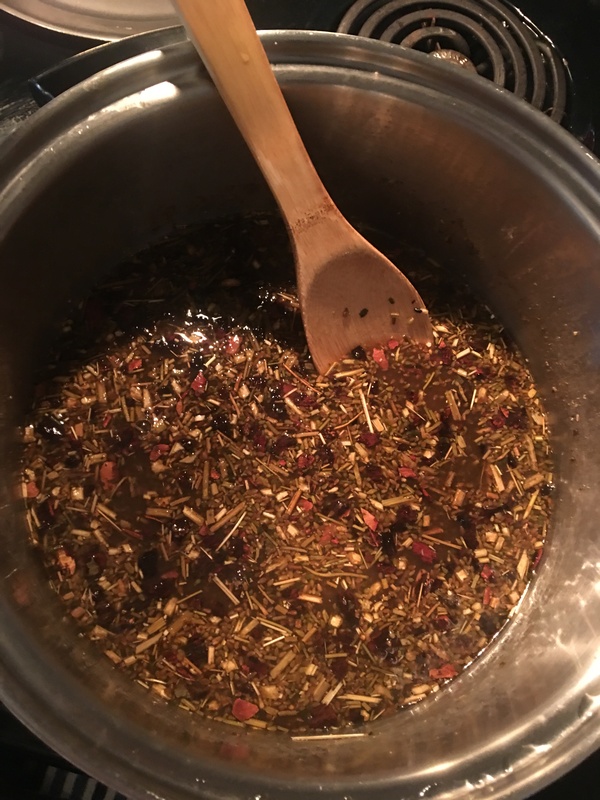 Here, I would like to present my cough and bronchitis remedy, that I made thoughtfully and with my best timing, star alignment wisdom, and all around kitchen witchery. Add the honey to 1.5 pints of water, and bring to a very slow simmer. Small white swirls will appear, these should be removed with a strainer as the honey heats up. 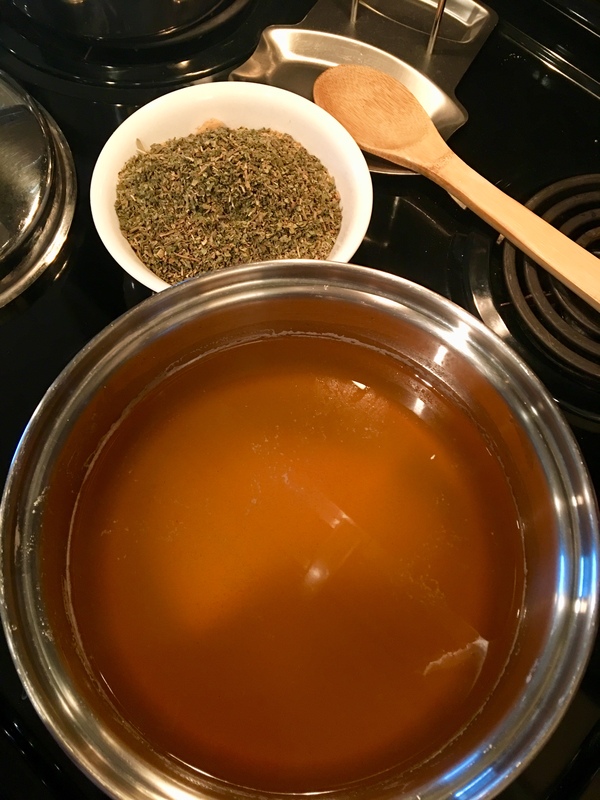 When the honey is well incorporated into a slow simmer, add all the herbs to the pot. Stir well, cover well, and let this simmer for 15 to 20 minutes. At this time, strain the liquid and you can toss out or compost the herb mash. 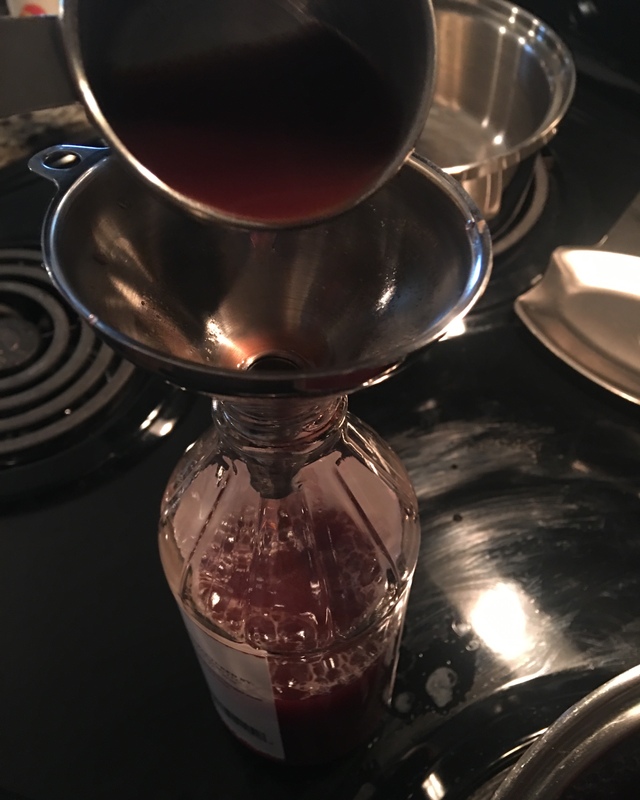 Pour in the pint of raspberry vinegar to the honey mixture, you’ll end up with out 3 to 3.5 pints of cough syrup. Bottle and keep in the refrigerator until needed. Dosage: 1 desertspoon (about 15ml or a good tablespoon) for an adult every 2 hours as needed. It tastes just awful, so be ready for that! If you give it to a child 12 or under, use about 10ml or 2 teaspoons, or less. It will help if you have large glass bottles on hand. I just had to use what I had on hand. I do not keep anything in plastic and don’t recommend it. These herbs are all known for respiratory properties of different types. You can easily look up the properties on the internet. So, this is what I use and have found to be trust worthy and curative for myself and others when I was a practicing herbalist. But this is not medical science. 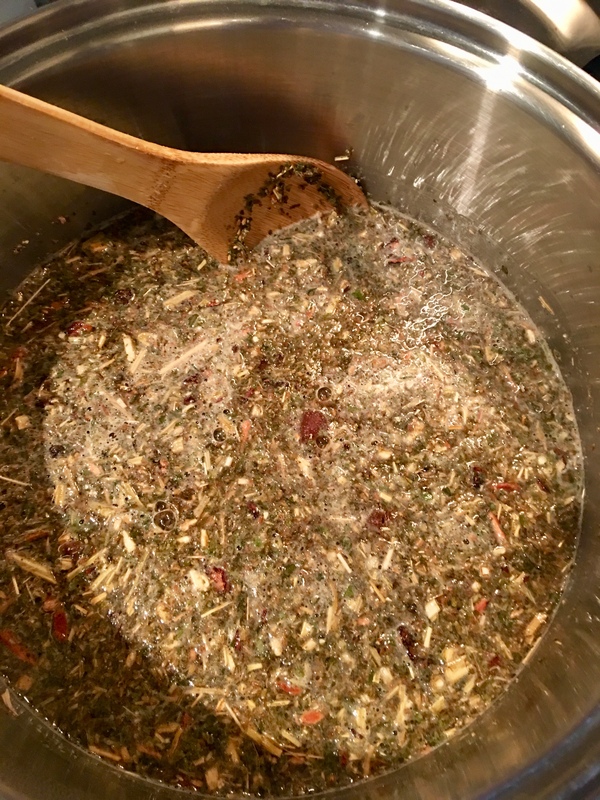 If you want to use other herbs, look for other recipes. 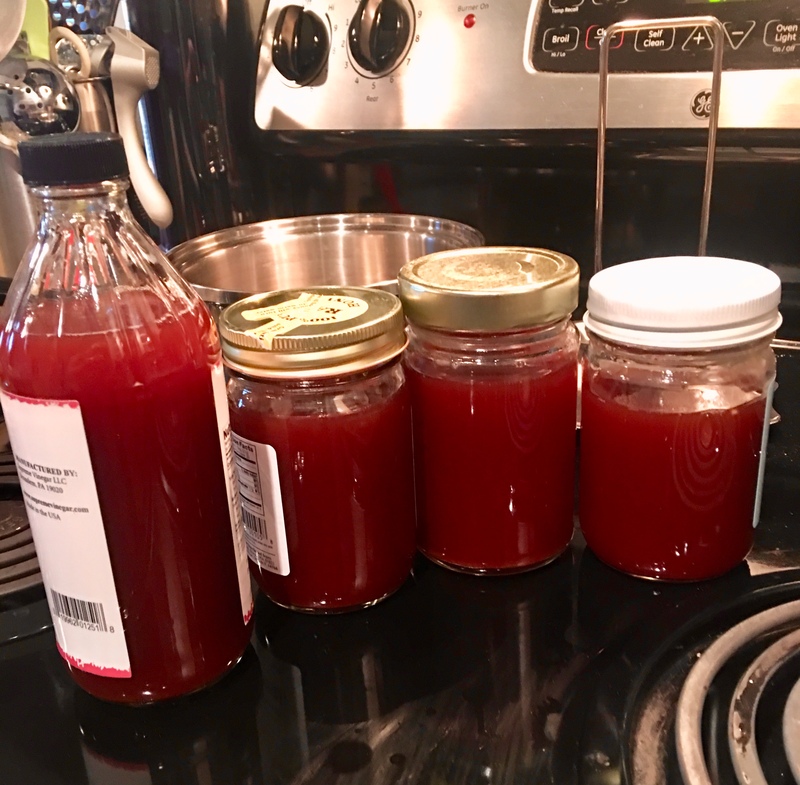 There are plenty out there that might be just as good and certainly taste better, but this is the one recipe that I can personally attest to. * Nothing in this article is written to prescribe or diagnose or cure any disease process or take the place of medical treatment. Do your own background research on all herbal remedies and exercise caution and informed diligence when creating your own medicines. This is my own recipe and is not any guarantee of outcomes. Lizzie Bennett is educated with a doctorate in natural health and is not a medical doctor. POD, POC, Boys and huh? Access Consciousness® has a wonderful clearing statement that might sound like gobbledy-gook at first, but Dr. Dain explains it wonderfully. Watch the short video, and let me know what you think! Curious about the Access Bars® process? Find out more about booking a Bars session in Lakewood WA. And if you want to take the Bars class, go to their website and look for classes. Amazing! Sometimes we feel the toll of life’s busy-ness and challenges, and feel like a weary traveler. There’s a call to pause and rest, and ignite the language of your inner Guide, and just Rest in your own being for a time. That’s the wonderful thing about the art of Moments in Rest – the heart has that place where there is no time, no judgement, just the realization that the Divine is always within. In the Christian faith, Saint Germain urged us to step away from the distraction of everyday for a moment and contemplate the Divine. Of course, no one religion can capture the Divine nature of the Creative Force – it was generative is the cosmos before humankind created a god and a religion and It will be there long after we disappear. But for now, we can take a step or two into the Unknown, Wild part of us that is untamed and unrepentent, daring, loving and free. This is the little altar of our True Self. Doctoring and healthcare services are those that you depend on not only for your health, but maybe even your life or the life of a loved one. Here are four patient-centered questions that you can ask to make sure your voice is heard, and to get a good understanding of answers that are important in your decision making processes. It has the added benefit of you assessing your own desires, willingness to adhere to changes, what is important, and how your future changes might look if you choose certain things. These patient-focused questions will help you to get a deeper understanding of what to expect and what you can do. And, you will be sharing what you want and are concerned about with your healthcare provider. Second: “What are my options and what might the benefits and harms of those options be?” This lets the personal preferences you have shared, and helps you address your own needs and outcomes that you care about. These could include things like personal autonomy in decision making, survival, symptoms, and how will your quality of life be affected. Third: “What can I do to improve the outcomes that are most important to me?” This lets your own individual differences, barriers, and preferences be considered when implementing health behavior changes and choices. Fourth: “How can you and the intervention (i.e., diet changes, exercise, surgery, medications) improve my chances of achieving the best outcomes?” This question will help you to understand what the physician or provider can do; what the healthcare system itself can help with (like referrals to physical therapy or counseling, for example), resources available, and what you are willing to choose and do. Sometimes paying for services is a barrier. In short, you will be asking yourself some deep questions, and asking your providers to help you navigate the anticipated changes, too. Health Care: Where’s the Respect? As the American Public calls more and more for the kind and caring health support system that includes respect, courtesy, and prompt attention , they are increasingly disappointed and see what “system” that remains as irretrievably broken. When “healthcare” became a commodity to be sold, the word “care” became demoted from a caring, respectful presence to a mechanical commodity to be delivered. In other words, the soul of the Registered Nurse, the glue and presence that was at the center of Health Caring became lessened, measured, and sacrificed on the altar of profit and efficiency. Today, more and more the American public demands compassion and respect. They demand to be HEARD, and tell the story of their condition, how they believe it got that way, how they feel, and what their frustrations are. And rightfully so, because all of this matters. A disease process is something that is experienced and lived through. It’s not just a mechanical malfunction to be drugged and charged for. In addition to physician and medical doctor interventions, there are a few Registered Nurses that are expert at health and wellness promotion. I am one. I listen, I can offer you a variety of supportive options, and can do so in economically feasible ways that can save health care dollars from an individual’s pockets over time. I recognize that individuals deserve to be active in their treatment and decisions. I commit to support health behavior changes with attention and health counseling that recognize and support you in making even the smallest of positive changes – because over time that’s a huge difference in disease conditions that are chronic. I commit to promote health, relationships, wellness, and supporting health through decisions and guidance when desired. If you have a chronic condition, please know that such conversations can help support the health behavior changes that you decide to make, especially those that support your goals for living and feeling better. Schedule your free 20-minute Women’s Wellness Discover call by clicking here. Rampant consumerism has engulfed the healthcare system in the United States. This will be no surprise to people who read about medical doctors at major insurance companies denying medical procedures without even looking at the medical records that accompany the request, the “opioid crisis” built around a drug that has made billions of dollars for its manufacturer, and even elite private “concierge” medicine where those who can afford it get private, quick medical consultations on their own schedules. I’m proud to be one of the last bastions of patient and personal health advocacy left – the legion of registered nurses who have had enough and are doing what they can about it. Many people only associate RNs with bedpans and pills in a hospital, or as obedient people who follow doctor’s orders without question. RNs have independent licenses, meaning we are free to use the 200+ nursing diagnoses at our disposal to assess, diagnose, plan, treat, and evaluate our practice and our interventions. When you come to see me for private health counseling and life coaching to guide you in making your own decisions and plans for health behavior changes, you remain in control but you also have a distinct advantage. People who don’t receive a sense of empathy, understanding, and warmth are less likely to be able to put changes and recommendations from their doctors into place, but those who do receive understanding and warmth from a nurse case manager (a nurse who works directly with you), are able to benefit from making changes (Fuertes, JN, Boylan LS, Fontanella JA. Behavioral indices in medical care outcomes: The working alliance, adherence, and related factors. Journal of General Internal medicine. 2009; 24(1): 80-85). In other words, nurses who stand ready to help patients privately and with intentional education and scientific based behavior change support are rare enough – but if you find one and work with her or him, you have almost doubled your chance of making those health-affirming behavior changes like losing weight, understanding medications, or stopping smoking. Finally, it’s good to know that an RN’s license is usually predicated on patient advocacy as our first duty, our contract with the state that issues our license.